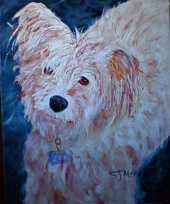 Pet Portraits are a great way to create lasting memories of treasured dogs. Pets have always been important to society at every level, as is evidenced by their inclusion in famous paintings from the past. Your dog is special too - right? So why not capture his uniqueness in a custom portrait and put it in a place of honor for all to see and admire. Although it's easy to get the process started for the commission of a portrait, the main thing is to start early if you need it by a certain date. It takes the artist time to create a masterpiece :-) For example, September is not too early if it's needed for Christmas. But your part is simple - all it takes are a few good snapshots of your dog. No doubt you have a ton of these tucked away somewhere - just waiting to be turned into a stunning work of art. 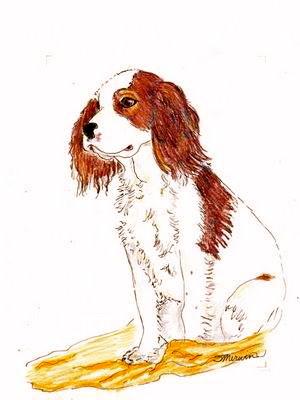 A picture is worth a thousand words so the saying goes, and a pet portrait of your dog will be a treasure forever. It is also a wonderful way to heal the loss of a beloved family pet who has passed on, but is not forgotten. 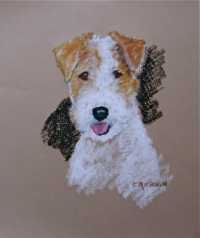 Or perhaps you have a dog loving friend you can surprise with a pet portrait - it makes a great gift. Once you decide to proceed with a portrait, do select the snapshots that best convey your dog's personality and uniqueness. The artist will use these photos to bring your dog's specialness alive on the canvas. And don't worry, while the portrait is in progress, you'll be reviewing it along with the artist. Style - contemporary, traditional, whimsical, popart etc. 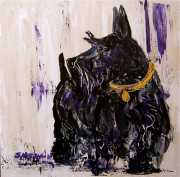 The techniques for creating your pet's portrait vary from original art creations to fabulous enhanced photo reproductions on canvas. Look over the choices we present to find the style you like, formal or casual, as this will set the mood for the portrait. For example, you may think your dog's personality fits well with the pop art style, or perhaps he has a traditional look that would be perfect for a more formal setting. To get you started, I've researched some excellent choices of style and art mediums for you to consider. Some of the techniques use computer assisted technology to create amazing results. While others use your photographs to create original images on canvas or paper. If you want to commission a fine art original pet portrait, the first step is to decide on the style of painting you want. All you need are some good quality photographs of the pet - the artists are very skilled at capturing the character and essence of your dog - as many delighted clients will attest. 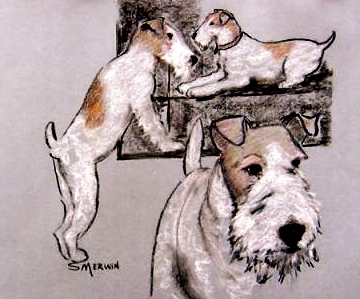 Sandra Merwin is a well-established and award-winning American artist who has been painting stunning portraits of domestic and wildlife species for several years. We believe her contemporary style is perfectly attuned to the loveable characteristics, energy and enduring spirit of canine companions. However, it has not gone unnoticed that Sandra has used her considerable artistic abilities to paint some outstanding works of other wildlife including horses, buffalo, birds, bears to name a few. in the panel to your right. 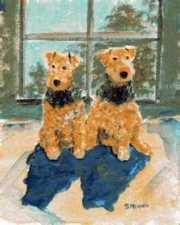 and on our Airedale Terrier art page. If you are thinking about a gift for a friend, please plan ahead so that the artist has ample time to create a work you will be proud to give. Portraits, which can be for one or more pets, are hand painted in your choice of oil, acrylic, charcoal, pen and ink, and watercolor. To learn more, without obligation, please contact us using the form below. Unleash the Art in your Pet with PopArtPet's - really fun creations. Using modern wizardry and creativity, your dog's photo images will be transformed into charming and irresistible custom portrait! 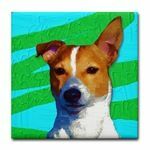 At Pop Art Pet, popular art styles are available to suit your vision - all of them very cool! Among them, the contemporary Warhol look, and the comic style of Style of Lichtenstein; but also traditional style portraits for those who prefer a more classical contemporary image. Your custom pet portrait will be printed on specially formulated canvas which produces museum-quality, truly archival prints with the look and feel of a real painting. Additionally, the inks used in the process are resistant to water and U/V rays for a lasting creation. If you are undecided about what you want, you will find a variety of artistic media here to give you some ideas and help you with your decision. These include: watercolors, photography, pencil sketches in black and white or color, and the timeless medium of oil. Perhaps you would just like to purchase a completed artwork of the breed you like, or one that reminds you of your own pet. You'll find many high quality artworks at the link above.